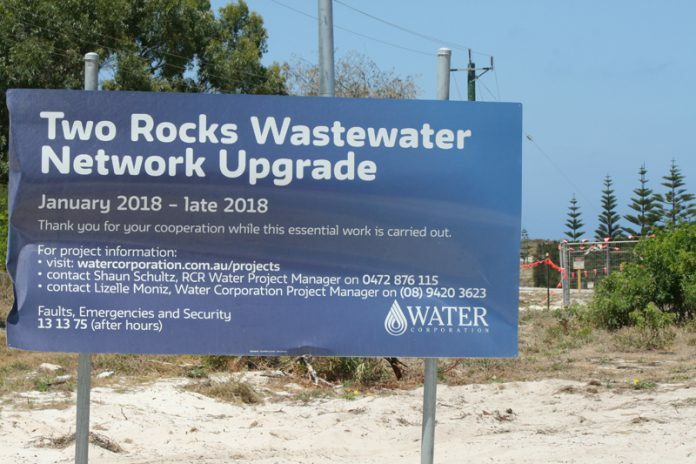 THE Two Rocks wastewater upgrade is due to be finished in mid-February, according to the Water Corporation. On Thursday, February 7 in response to questions about the tidying up of Lisford Ave and the removal of broken kerbing rubble, a Water Corporation assets delivery general manager Nathan Hardwick said areas around wastewater upgrade would be reinstated and cleaned up as closely as possible to their original condition. “Final reinstatements will be completed mid-February once all construction activity is completed,’’ he said. The Water Corporation is installing the last section of very deep sewer pipe along Lisford Ave, at the intersection of Sovereign Dr. This work is due to be finished by Monday, February 11. To help minimise dust and rubble during the wastewater upgrade the Water Corporation has been using water trucks to keep the soil damp and mesh fencing has been erected around construction areas. Mr Hardwick said the Water Corporation would need to access the new below ground pump station, located in Charnwood Reserve, about twice a month to carry out general maintenance.